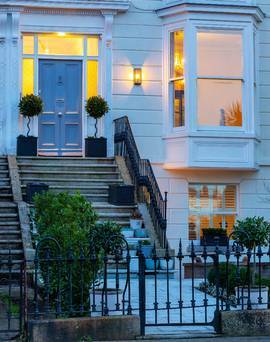 If 7 Eden Park in Glasthule looks familiar to stalwarts of the property pages, it is because the Victorian terraced house was last on the market just over a year ago. They transformed No 7 into a generous family home with four bedrooms, a study, TV room, drawing and dining room as well as a modern open plan kitchen/dining /living space on the garden level ground floor. The current vendors, Adam White-Parsons and his partner (and their dogs Zeus and Lola) say that with one exception, the changes they have made since moving in last December have been cosmetic, painting one or two of the rooms and filling the place with antiques and artwork. The only major work they did was to the master bedroom, a palatial room that was once the drawing room. Here, they removed an en suite with frosted glass walls and walk-in wardrobe which took up one side of the room and, instead, took a slice off the adjoining bedroom for a new en suite. “We just finished it two weeks ago,” says Adam, who hails from Australia. They also built in storage space along one entire wall. The house is wonderfully elegant and spacious. The ground floor has an L-shaped open/plan kitchen/ dining /living space with a quartz-topped kitchen island, wine cooler, integrated Neff appliances, a wall of good storage space and a good-sized pantry/utility room with space for an extra fridge and laundry. The ground floor is oak parquet throughout. Adam also frosted a plain glass wall that sheets off the side of the stairs to hive off a little more storage space. A guest loo sculpted out of the former coal hole under the front steps has been glammed up ‘disco style’, while a cosy TV room with wood burning stove is a favourite night time spot for the owners. On the entrance level, the original floorboards are painted black. The formal drawing room has a large bay window, and an original black marble mantelpiece with unusual green Victorian tiling. The dining room is a dramatic shade of inkwell blue and looks over the rear garden. On the return, the original room has been reconfigured into a mezzanine with glass balcony overlooking the ground floor living space. Here, a loom has pride of place – Adam’s partner is a gifted weaver – but Adam says it would also make a perfect library. There is also a guest bedroom. The first floor has a high-ceilinged office/ bedroom as well as that showstopping master suite with views over the rooftops out to Scotsman’s Bay and up the street to St Joseph’s Church. The top floor has a family bathroom with freestanding bath, encaustic tile floor and rainwater shower. The fourth bedroom is also on this floor. Adam and his partner are into tech, and the house has a monitored alarm system with CCTV, controlled via an app, as well as a video entry system and a fob to open the ground floor door instead of a key. No 7 Eden Park would make an ideal family home. Not only is it just minutes from Sandycove Dart station, but it is also close to shops and a good number of primary and secondary schools. Sandycove beach, The Forty Foot and Seapoint are a great draw for families in summer – and for the hardened swimmer all year around. The terrace of 13 houses is set back from the main Dun Laoghaire to Dalkey road behind a green space. To the left is a recycling facility with additional parking, and there is permit parking for residents. Adam’s three-year stay in Dublin is at an end, and the future lies in Michigan in the US, where his partner has just been relocated. “We just got the call a month ago,” says Adam, “otherwise we’d be staying.” He has enjoyed his time here, but there is one thing he still has to do – swim at the Forty Foot. “I’m going to do it before I go,” he promises.